Want to try a standing desk but need to stick to a budget? It seems you’re not alone. At least four recent and very popular Kickstarter projects have featured ideas for the perfect budget standing desk. With most standing desks starting at more than $500 and a large proportion of those costing anywhere from $1000 to $3000, there’s obviously a market for good inexpensive standing desks. The question is: will they stand up (as it were) to daily use? 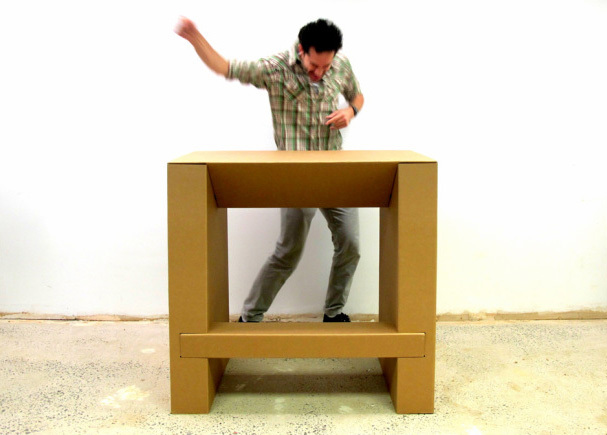 Let’s start with the cheapest Kickstarter project for a standing desk we could find, the Cardboard Standing Desk by Zach Roltholz of chairigami. The project was successfully funded on April 11, 2014. (In fact, Zach received $50,091 from backers, twice his initial goal of $25,000.) This product will be offered for $95, with free shipping to all U.S. addresses included, and the expected ship date is July 2014. Made out of thick corrugated cardboard, the desk is put together simply by folding – no glue, fasteners, or any other materials are required. You may have your doubts about the sturdiness of this desk but the manufacturers claim that, while the desk itself only weighs 15 pounds (and so can be easily moved around your office), it can hold up to 300 pounds! In fact, the more weight you put on it (up to that 300 pound point), the sturdier it becomes. The catch? It will only last two to three years. It is, however, fully recyclable. This desk has a height of 42″, which is standard bar counter height. 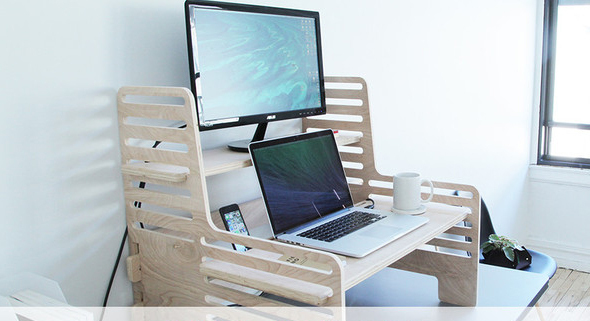 Now on to the Stork Stand Desk, which is currently being offered on Kickstarter for $179. Although at the time of this writing, there are still 40 hours to go before the campaign closes, Mike Goldberg has raised a bit more than his initial goal of $50,000. Weighing only 4.2 pounds, this small desk, which attaches to the back of most office chairs with the help of a metal brace and a thick Velcro strap, was designed with mobility in mind. It would work with most laptops and holds up to 50 pounds. Beta testers express amazement at how sturdy this seemingly jerry-rigged standing desk actually is and the manufacturers insist it works with 90% of office chairs, ranging from thin task chairs to thick leather ones. We’re curious to try it out for ourselves. You can pre-order it now. The standard UpStanding Desk will be sold for $199.99, but if you’re handy, you can purchase the plans for $49.99 and make one yourself. Made out of Canadian birch plywood, this is one of those desks you put on top of your regular desk. Like the Cardboard Standing Desk, it is simply slotted together. No other fasteners are required. It too is very lightweight (around 10 pounds) and can be assembled in about a minute if you know what you’re doing, which makes it very portable. And last but not least: Steven Yu’s Kickstarter project to produce the most affordable automatic sit-to-standing desk on the market was successfully funded on May 16, 2014, with backers pitching in with almost $650,000, well over and above Yu’s initial $50,000 goal. 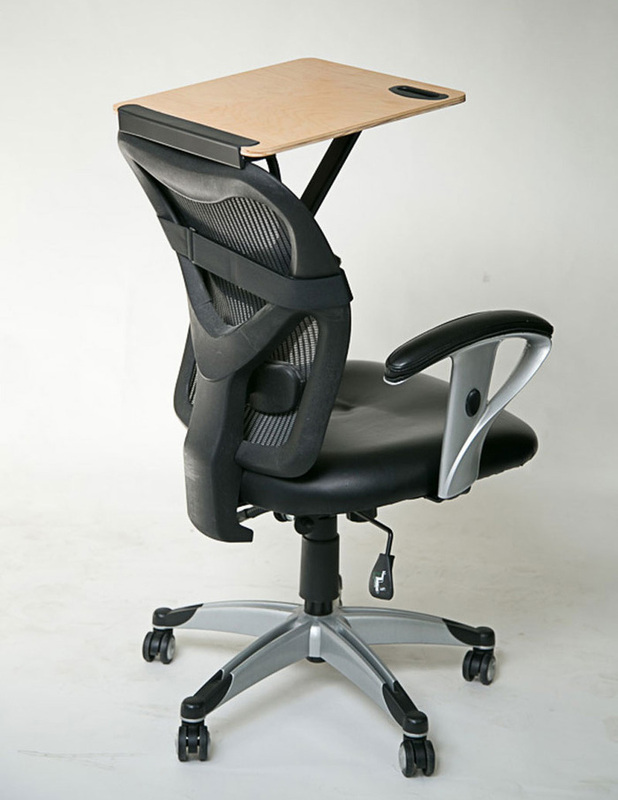 Simply called the StandDesk, the base model can be pre-ordered now for $449.00. 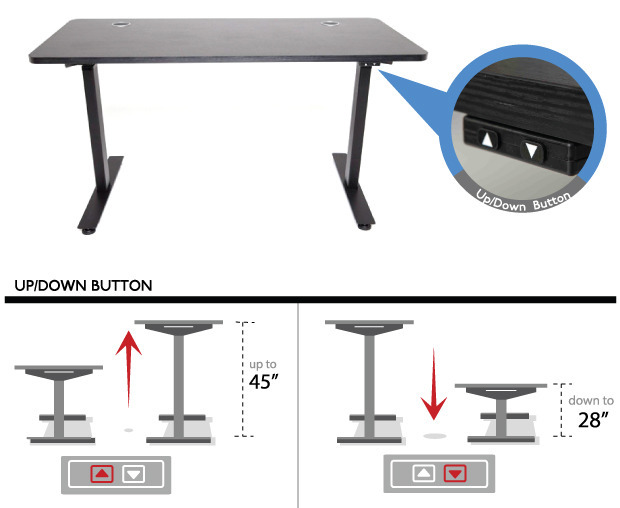 With a height that can move from 28” to 45” at the touch of a button, this desk will lift up to 225 pounds. So there you have it. You (and a whole bunch of other people) have said that you want a good budget standing desk and these four Kickstarter entrepreneurs have listened. We’ll be keeping our eye on these products over the coming months, in order to find out if they work as well as we’d like. What we can say for certain at this point, though, is that in each case the price is right! Hi there. Have you seen our new product? It’s way cooler and more unique than any other patented standing desk.